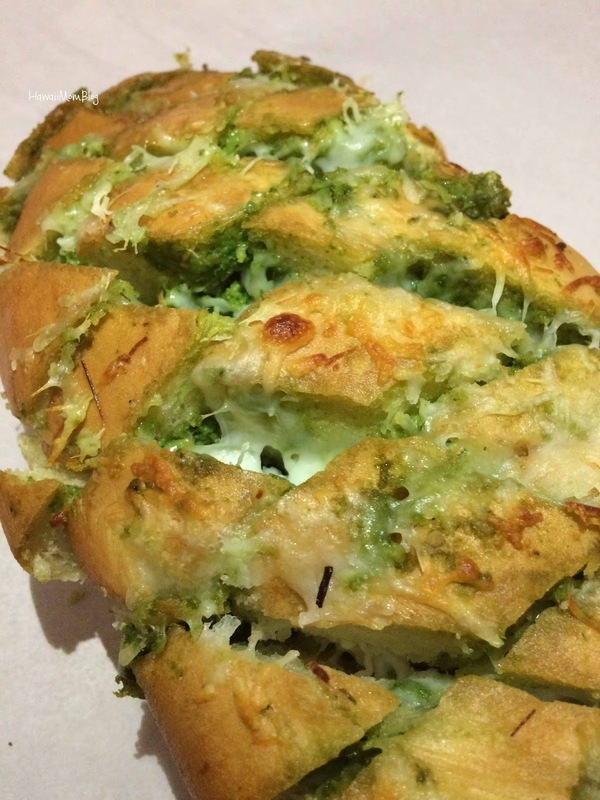 For a recent get-together I made Pesto Pull-Apart Bread. If you love pesto you'll love this appetizer! Simply take a loaf of French Bread, and cut diagonal slices through the bread to make a criss-cross pattern. Be sure not to cut all the way through to the bottom of the bread, or else it'll turn into "fall-apart" bread instead of pull-apart (I left about a 1/2 inch margin on the bottom). Next, I poured 1/4 c melted butter all over and inside the bread. I then took 1 c of jarred pesto, and spread it throughout the cuts of bread (if you have a second set of hands to help you - it will make things go a lot faster). Then I took 1 1/2 c of shredded mozzarella cheese and stuffed them into the slices. Wrap the bread tightly in foil, then bake for 15 minutes at 375 degrees Fahrenheit. Open up the top of the foil, and bake for 10 minutes more, until the cheese is melted and slightly golden brown. You can see the original recipe here on ABC's The Chew.